Marwan Barghouti is currently serving 5 life sentences for orchestrating three shooting attacks that killed 5 people: one attack in Jerusalem (June 12, 2001) in which Greek monk Tsibouktsakis Germanus was murdered by terrorist Ismail Radaida and another unidentified terrorist, another attack at a gas station in Givat Zeev near Jerusalem (Jan. 15, 2002) in which Yoela Hen, 45, was murdered by terrorists led by Mohammed Matla, and one shooting and stabbing attack at the Sea Food Market restaurant in Tel Aviv (March 5, 2002) in which Eli Dahan, 53, Yosef Habi, 52, and Police Officer Sergeant-Major Salim Barakat, 33, were murdered by terrorist Ibrahim Hasouna. When arrested by Israel in 2002, Barghouti headed the Tanzim (Fatah terror faction). After he was convicted and imprisoned, he was re-elected member of the Palestinian Authority parliament. On Dec. 4, 2016, he was elected to Fatah's Central Committee. "Fatah Movement Central Committee member [and Fatah Commissioner for Arab and China Relations] Abbas Zaki said… yesterday [March 21, 2019] in an interview with Radio Mawtini in memory of the 51st anniversary of the Al-Karameh battle that took place on March 21, 1968… that 'We still have hope for peace, but we will not be servants, will not succumb, and will not be prisoners of coexistence with this hangman – in other words, the Israeli occupation state. We will continue our struggle until we obtain our goals, an independent state whose capital is Jerusalem – and Haifa, Lod, Jaffa, and Safed (i.e., Israeli cities) will remain in our minds and thoughts, and they are dearer than us. He also praised the path of struggle of the Palestinian people, and its willpower that has created schools for heroism since the Al-Karameh battle and what came before it, and until this day. 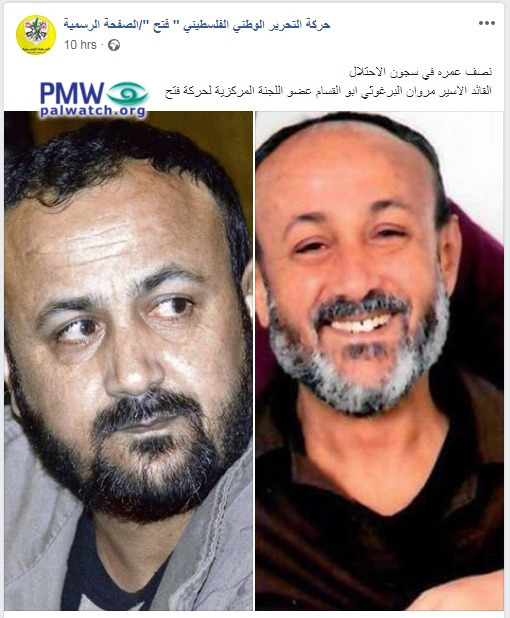 He expressed his esteem for the Martyrs' souls and saluted the prisoner movement and the prisoners who face the dangers of the occupation's prisons at every moment..."
The images show terrorist Marwan Barghouti, who orchestrated three attacks in which 5 were murdered. “The popular campaign to release leader Marwan Barghouti and the rest of the prisoners sitting in the occupation’s prison marked the 16th anniversary of Fatah Central Committee member Marwan Barghouti’s arrest yesterday [April 15, 2018] at a rally held at the Palace of Culture in Ramallah, with the participation of hundreds of members of our people. He added: ‘The anniversary of Marwan Barghouti’s kidnapping takes place at the same time as the anniversary of the death as a Martyr (Shahid) of leader Khalil Al-Wazir ‘Abu Jihad’ (i.e., terrorist, responsible for murder of 125)… Khalil Al-Wazir was and will remain our example and a role model… He emphasized that the leadership opposes all of the external pressures concerning the prisoners, which [PA] President Mahmoud Abbas emphasized: ‘If we will only be left with a few Dirhams (i.e., a currency in some Arab states), we will allocate them to the families of the prisoners as a sign of appreciation for their sacrifice.’"
Two posters are shown; the poster on the left shows arch-terrorist Khalil Al-Wazir “Abu Jihad,” responsible for the murder of 125 Israelis; in the upper right corner is the logo of the Al-Aqsa Martyrs’ Brigades with crossed assault rifles and a grenade over the Dome of the Rock. 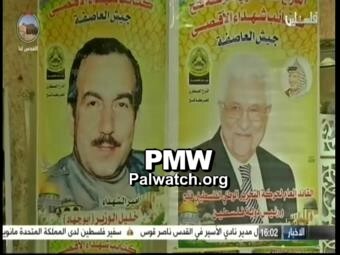 The poster on the right shows PA Chairman Mahmoud Abbas; in the upper left is the logo of the Al-Aqsa Martyrs’ Brigades, and in the upper right is former PLO and PA Chairman Yasser Arafat. 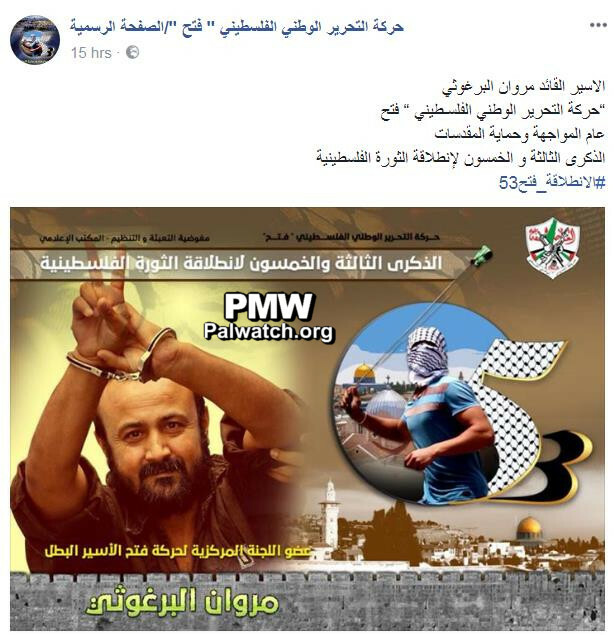 Fatah post for 53rd anniversary glorifies imprisoned terrorist Marwan Barghouti as a "heroic prisoner"
Headline: "The occupation arrested the composer of 'A Song for Kubar'"
Al-Barghouti's arrest was preceded by 'a huge amount' of incitement and racism by the Israeli leaders, which led in recent months and even before that to the cancellation of freedoms, killing, abuse, settlement, Judaization, and demolitions, in blatant violation of human morals and standards... The occupation state - which has a record packed full of assassinations, especially against politicians, artists, writers, and authors - has already closed Palestinian radio stations and news channels on the pretext of incitement in the past..."
Headline: "Karake: Barghouti lives in a prison cell that is similar to a grave, and Israel targets his life"
"Director of [PLO] Commission of Prisoners and Released Prisoners’ Affairs Issa Karake warned in a statement yesterday [May 5, 2017] against harm to the life of prisoner leadership member Marwan Barghouti (i.e., terrorist who orchestrated three shooting attacks in which 5 were murdered), who has been in solitary confinement in the Al-Jalameh Prison since the beginning of the unlimited hunger strike on April 17, 2017. Karake revealed that the incitement campaign against Barghouti in the Israeli political echelon is rousing a fear that the occupation government will assassinate him directly or indirectly." Headline: "Abd Al-Rahim: The prisoners are carrying out a heroic act that will be recorded in history in letters of light and fire"
He added: 'This event is taking place while our brave prisoners’ [hunger] strike enters its eighth day… The occupation wants to break the determination of this people and to harm its stability, its spark, and its legal resistance. However, our brothers and friends Marwan Barghouti (i.e., terrorist who orchestrated three shooting attacks in which 5 were murdered), Karim Younes (i.e., terrorist, murdered 1), Ahmad Sa’adat (i.e., head of the PFLP terror organization), Mahmoud Abu Sorour (i.e., terrorist, murdered 1), and Anas Jaradat (i.e., terrorist, responsible for murder of 31) are carrying out a heroic act in the battle of freedom and dignity that will be registered in history in letters of light and fire as part of our journey of eternal life and victory.'" Marwan Barghouti – Palestinian terrorist who is serving 5 life sentences for orchestrating three shooting attacks that killed 5 people: one attack in Jerusalem (June 12, 2001) in which Greek monk Tsibouktsakis Germanus was murdered by terrorist Ismail Radaida and another unidentified terrorist, another attack at a gas station in Givat Zeev near Jerusalem (Jan. 15, 2002) in which Yoela Hen, 45, was murdered by terrorists led by Mohammed Matla, and one shooting and stabbing attack at the Sea Food Market restaurant in Tel Aviv (March 5, 2002) in which Eli Dahan, 53, Yosef Habi, 52, and Police Officer Sergeant-Major Salim Barakat, 33, were murdered by terrorist Ibrahim Hasouna. When arrested by Israel in 2002, Barghouti headed the Tanzim (Fatah terror faction). After he was convicted and imprisoned, he was re-elected member of the Palestinian Authority parliament. On Dec. 4, 2016, he was elected to Fatah's Central Committee. “The [PA] Ministry of Education and Higher Education organized a mass support rally [for the prisoners] in the ministry plaza, in which [PA] Minister [of Education] Dr. Sabri Saidam, Deputy Minister [of Education] Dr. Basri Saleh, the minister’s aides, and all of the ministry employees participated. Headline: "From Barghouti to the students of Palestine: 'Knowledge is your weapon to liberate the homeland'"
In order to be creative in resisting the colonialist, we must be creative in our studies, education, and culture. I say to you - I was arrested for the first time when I was in high school, I took the matriculation exams in prison, and continued on the path of study and obtained a bachelor's degree, master's degree, and doctorate. This was despite being imprisoned for more than 23 years, expelled for seven years, and subjected to pursuit and assassination attempts. I say this to you in order to emphasize to you that the path of studies and the national path go side by side.'" PLO official: Israeli MPs' statements against terrorist Marwan Barghouti are "monstrous," "similar to the claims of Nazi leaders," and "from them wafts a smell of hate, racism, and corruption"
Posted text: “Director of [PLO] Commission of Prisoners’ Affairs Issa Karake said that the Israeli ministers’ statements against prisoner Marwan Barghouti (i.e., terrorist who orchestrated three shooting attacks in which 5 were murdered), the demand to execute him (see note below –Ed. ), and the incitement against the prisoners (PMW could find no basis for claims of incitement –Ed.) are monstrous statements that are similar to the statements of the Nazi leaders , and from them wafts a smell of hate, racism, and corruption. Karake noted that these statements, which were accompanied by arbitrary steps of oppression against the [hunger] strikers… point to an official Israeli political decision to suppress the strike and break the willpower of the strikers, which will lead to an explosion of the situation and an escalation within and outside of the prisons. Karake held the occupation fully responsible for the consequences of the strike and its likely results. He said that the incitement by Israel against the prisoners reminds us of Germany in 1933, and that the present government in Israel has begun to constitute a danger to security and peace in the region, in that it has opened a third front against the defenseless prisoners and against their legitimate humanitarian demands. Click "full article" for more. O Jaffa, Dalal [Mughrabi] liberated your land." Headline: "The Fatah parliamentary faction: Marwan Barghouti is still a shining and renewing flame of resolve and struggle"
"The Fatah parliamentary faction said in a statement for the 15th anniversary of the arrest of leader, [PA] Parliament member, prisoner, and Fatah Central Committee member Marwan Barghouti (i.e., terrorist who orchestrated three shooting attacks in which 5 were murdered): 'Prisoner Barghouti, who has begun his 16th year in prison, still constitutes a shining and renewing flame of struggle, and together with his comrades is heading an epic of resolve and heroism in the face of the captivity, the jailors, the occupation's injustice, and the ongoing oppression of our heroic prisoners and our people everywhere.' The Fatah faction sent its regards and pride to leader Parliament member Barghouti and to all of the heroic male and female prisoners who will begin a new epic of resolve and heroism in a few days when they go on a hunger strike against the Israeli occupation and its racist policy of oppression, which denies the rights of the prisoners and the rights of our Palestinian people." PA Prime Minister honors Palestinian imprisoned terrorists’ strike, conveys “appreciation,” calls on all Palestinians to show solidarity. Headline: "Hamdallah to the prisoners: We are standing beside you in the [hunger] strike battle on the way to freedom"
"Palestinian [PA] Prime Minister Rami Hamdallah emphasized that his government is working on all levels to provide the prisoners' cause with the legal and international momentum and support it deserves. For Palestinian Prisoner's Day Hamdallah conveyed a greeting and appreciation to the female and male prisoners in the Israeli occupation's prisons, and emphasized the Palestinian leadership's diligence in presenting the prisoners’ suffering in order to guarantee the end of the occupation, the breaking of its chains, and their unconditional release. He added: 'We are again feeling the suffering of the prisoners and the cruelty of the occupation, but at the same time we feel pride and honor in the resolve of the prisoners’ movement and its sacrifice. 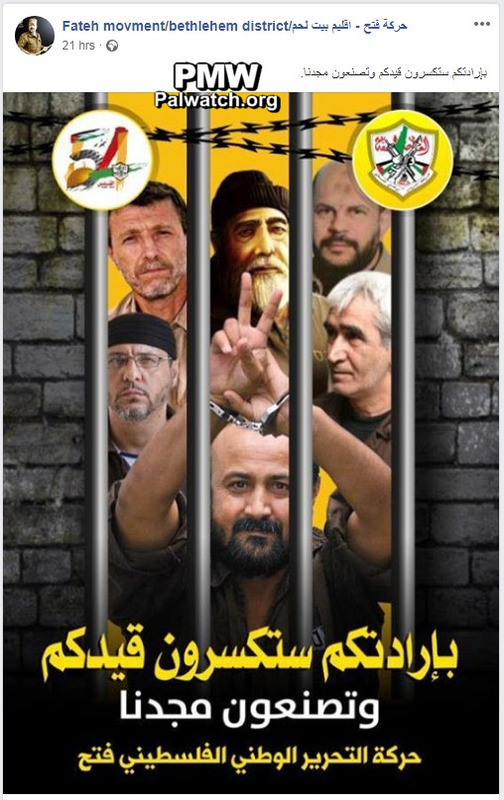 We, the leadership and the people, stand united behind you and raise our heads high before the battle of freedom (i.e., a prisoner hunger strike that began on April 17, 2017) that you are waging under the leadership of fighter Marwan Barghouti (i.e., terrorist who orchestrated three shooting attacks in which 5 were murdered) and his brothers from all the factions of national and Islamic activity.' Hamdallah also called on the Palestinian people and all of the national activists and institutions to increase their solidarity [activities] so that the prisoners' message will reach all parts of the world." Post by Fatah's Shabiba student movement for the elections at An-Najah University. The image shows a rifle and a picture of Marwan Barghouti, an imprisoned Palestinian terrorist who orchestrated three shooting attacks in which 5 were murdered, making the "V" for victory with his handcuffed hands. Barghouti is also a PA parliament member and a Fatah Central Committee member. 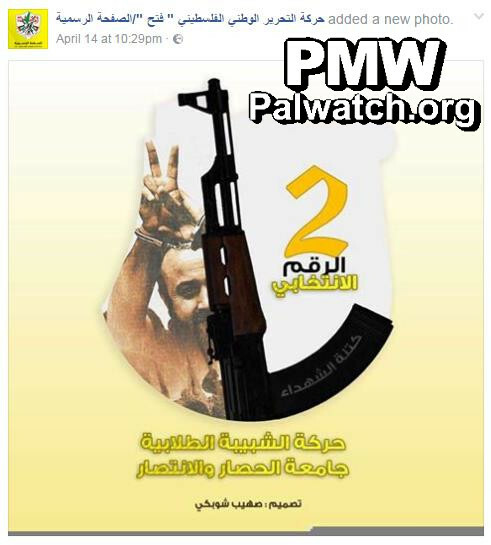 Text to right of rifle: "2 – the number [to vote for Fatah] in the elections"
Text on the rifle: "The Martyrs' (Shahids') cell"
“The [PA] Ministry of Education and Higher Education today [April 13, 2017] announced its joining the unlimited hunger strike of the prisoners in the occupation’s prisons by holding a series of activities and events of solidarity with the prisoners on Monday, April 17, 2017, which is Prisoner’s Day.